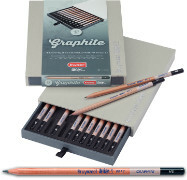 Boasting 60 years making top quality art pencils, Dutch company Bruynzeel Sakura offer a great range of pencils for all artists. The combination of the two seperate brands Dutch Bruynzeel and Japanese Sakura in 1997 gives them a wide appeal that crosses the generations. The Bruynzeel Design range meets all the high requirements expected from pencils designed for professionals. A subtle sense of colour, good colour transfer, fine texture and excellent mixing qualities coordinated with a great range of colours and hardnesses. High quality pencils that have formed the basis of their manufacturing for decades. Not widely available in the UK we offer all our ranges as singles as well as the beautifully packaged Bruynzeel boxes. 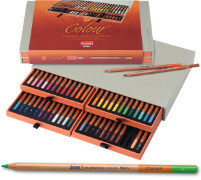 Design by Bruynzeel Sakura - Colour Pencils offers a great range of coloured pencils made from the highest quality pigments. The colours transfer well and they are perfect for applying several layers of colour on top of each other. Design by Bruynzeel Sakura - Pastel Pencils can be used dry or add water to create a wide range of effects. With Bruynzeel's usual high quality pigments, full blendability and a lovely range of 48 colours it is one of the nicest pastel pencils around. Design by Bruynzeel Sakura - Graphite Pencils are made for use in art, design, sketching and illustration work as well as technical drawing. Excellent transference and available in 12 grades to suit everyone. Design by Bruynzeel Sakura - Watercolour Pencils (Aquarel) have a colour core made from from fine, high quality colour pigments that transfer very well and dissolve fully in water. Can be applied both wet or dry.